Customers or employees too hot or too cold. Wireless Remote Thermostat and Wireless Damper can be used to adjust the amount of airflow into a space using the remote mode or maintain a comfortable temperature using the thermostat mode. Wireless Remote and Wireless Damper can be used to adjust the amount of airflow into a space. If a customer needs less airflow at their table, the manager can lower the airflow from the diffuser to increase comfort. Wireless Thermostat and Wireless Damper adjusts the airflow to maintain a comfortable temperature. Manual Wall Control is wired to the variable position damper and can be used to adjust the amount of airflow into the space. Wireless Remote Thermostat and Wireless Damper can be used to adjust the amount of airflow into a space using the remote mode or program a schedule using the thermostat mode. Wireless Remote and Wireless Damper can be used to adjust the amount of airflow into a space. If the space is unoccupied, use the remote to lower the airflow from the diffuser. Wireless Thermostat and Wireless Damper adjusts the airflow to maintain a comfortable temperature based on your work schedule so airflow is reduced at night. Occupancy Sensor is wired to the variable position damper and automatically detects when lights are turned on or off and adjusts the airflow to the Occupied or Vacant setting. Finding a powerful zoning panel that includes more features, wireless, easier to install, and at a low competitive cost for light commercial. The ProC series features 2 to 6 zones in the same case, for gas/electric, conventional heat pumps and dual fuel heat pumps with 2 stages of heating and 1 stage cooling or 1 stage heating and 2 stages of cooling. Compatible with any 24VAC, battery powered or power sharing thermostat. Or, communicates wirelessly to the T200WZ or T500WZ thermostat. Title 24 and ASHRAE 62-2. The panels are programmed using the handheld programming display, PDMi3, free to qualified contractors or programmed using the PDM on the panel. 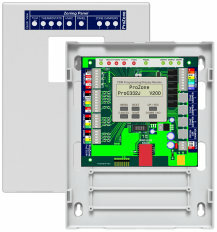 The programming display can be used to guide the installer through set up, test the installation, set bypass options, clone multiple panels and set advanced options.